We participated in the Concours d’Elegance of America this past weekend at The Inn at St. John’s in Plymouth, Michigan. Our 1940 Packard Darrin was on display in the Founding Fathers circle. 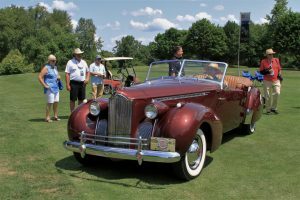 It was previously owned by Dave Holls, GM exec and founder of the Meadowbrook Concours. We also displayed our 1938 Mercedes Benz 320 and our 1934 Hupmobile T427, both taking home Best in Class awards. All in all, it was a great show and we look forward to next year. Check out more photos from the show on our Facebook by clicking here. 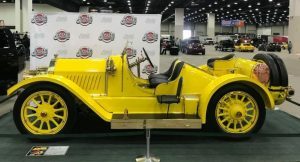 See our 1911 Olds Autocrat at Autorama! If you are heading down to Cobo for the Autorama this weekend, be sure to stop by booth 624 and see our 1911 Oldsmobile Autocrat! The Yellow Peril sits on 38″ tires and is powered by a massive T-head 4-cylinder engine capable of displacing 500 cubic inches! 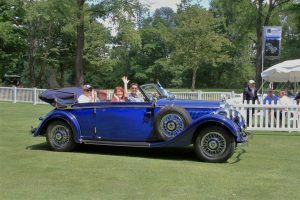 The vehicle has a custom boat-tail body built by the original owner, John Henry Greenway Albert. Yellow Peril has competed in many races in its lifetime including the Great American Race from 1984-1986 and even traveled 3,000 miles through the Canadian Rockies! 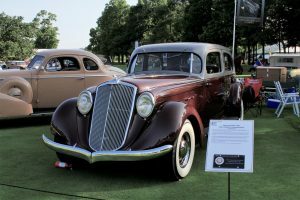 It retains the original engine, drive train, and bodywork. Come by and say hi to Yellow Peril this weekend! 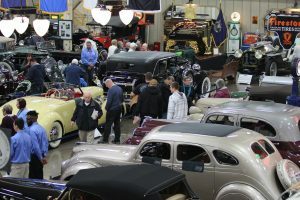 Join us at Chrome & Ice Winter Indoor Car Show sponsored by Buick and Back to the Bricks! The show runs Friday, February 9, 2018 from Noon – 9PM and Saturday, February 10, 2018 from 9AM – 9PM at the Dort Federal Credit Union Event Center in Flint, Michigan. Tickets are $8.00 per person, $5.00 for ages 12 – 17, and free for children under 12. 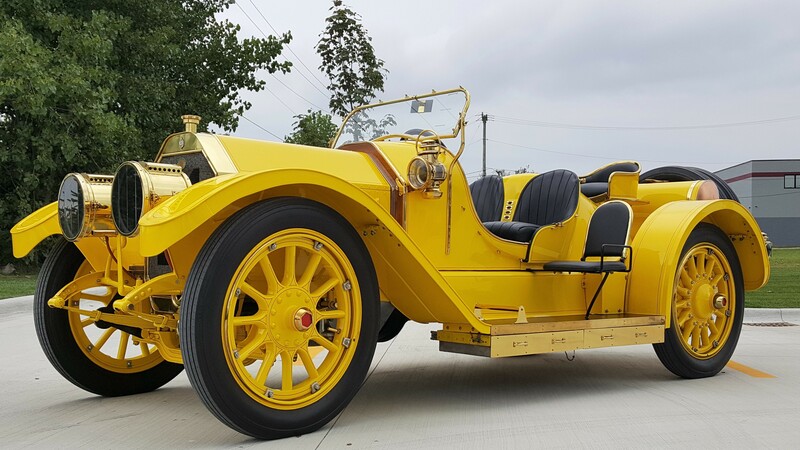 We will be showing off our 1911 Oldsmobile Autocrat “Yellow Peril”! A fascinating race car with many stories to tell! Click here for more info on Chrome & Ice! 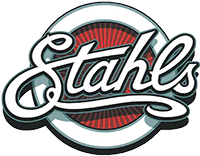 Detroit Tigers Caravan stops at Stahls! 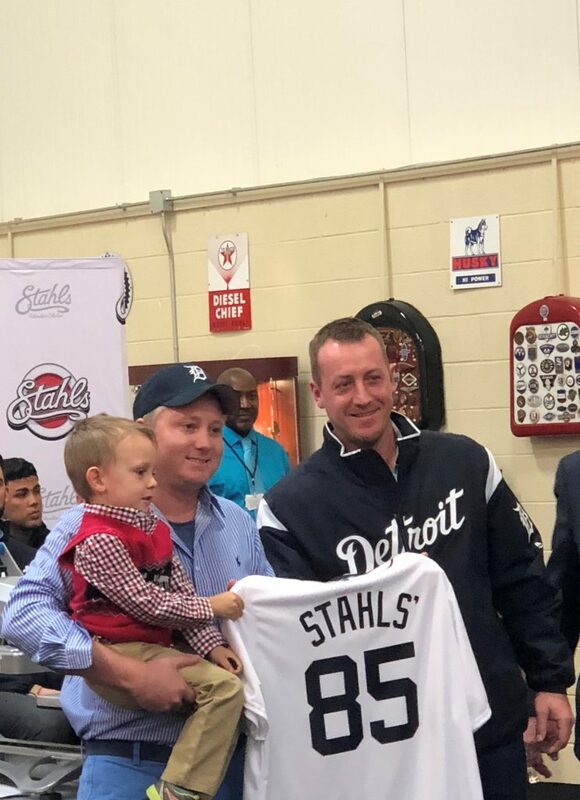 The Detroit Tigers stopped at Stahls Auto Museum on Thursday, January 25 as part of their Winter Caravan. The players in attendance included Jordan Zimmermann, Michael Fulmer, and Drew VerHagen just to name a few. 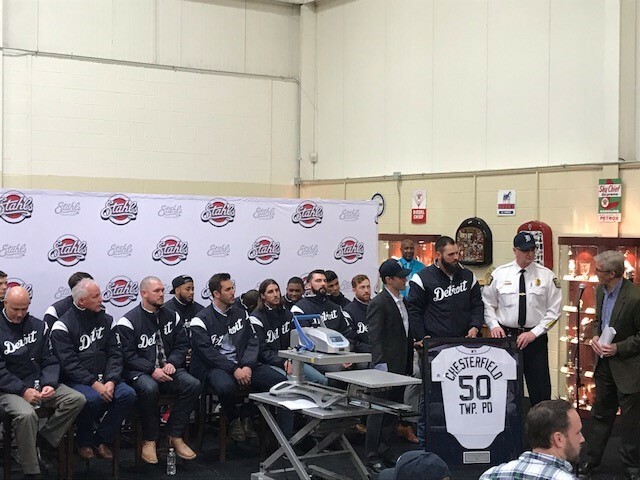 Sportscaster Dan Dickerson presented commemorative Tigers jerseys to Chesterfield Township Supervisor Dan Acciavatti and Police Chief Brad Kersten for Chesterfield Township Police Departments 50th anniversary, and also to Dan and AC Stahl for Stahls 85th anniversary. 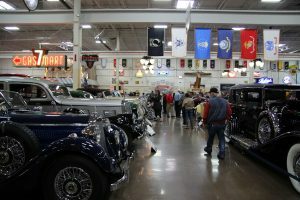 The players and staff strolled through the museum and were even able to sit in a few vehicles! Celebrating Macomb County’s 200th birthday! We are partnering with the Macomb County Heritage Alliance in celebrating the Bicentennial of Macomb County! Get your passport here or if you already have one, come on in and get a stamp! Collect 7 stamps and get a free meal at participating Culvers in Macomb County! There are many great historical locations on the passport to visit in Macomb County so come get yours today! 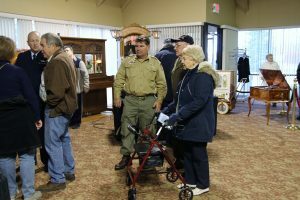 What a wonderful turnout we had for our 4th Annual Veterans Day Open House! Veterans, their families and those who just wanted to honor our heros with a “thank you for your service” strolled the museum to the sounds of organist Dave Wickerham. Visitors also had the opportunity of being the first to hear our new 1920 Gaudin Dance Hall Organ play. 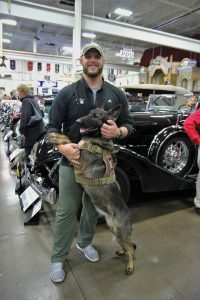 We were pleased to partner with Guardian Angels Medical Service Dogs, Inc. as this years charity. Veteran Mike Ronan is pictured here with Julie, his pup he received from Guardian Angels. Mike told his very touching story to our guests and we so happy to hear how Julie turned his life around. We thank all who donated and hope to see you all again next year! 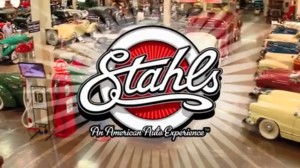 Click here for more photos on the Stahls Automotive Foundation Facebook Page. Stahls Automotive Museum opens its doors to veterans, current service members, and all who wish to recognize those who have served our country. Participate in activities specially prepared to honor our service members and encourage discussion between the generations. Watch historic military footage along with a selection of Bob Hope’s USO Tour footage, and enjoy the museum’s premiere collection of Brass Age, Depression Era, Pre-War, and Post-War Vehicles. The event is open to the public. 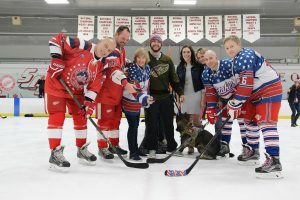 All donations will benefit Guardian Angels, Medical Service Dogs, Inc. Pairing Michigan veterans with individually trained medical service dogs. What an amazing 3 days! 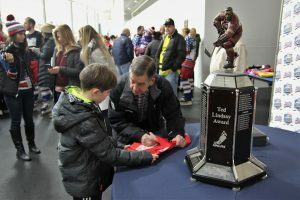 Our Hat Trick for Heroes event was a booming success! 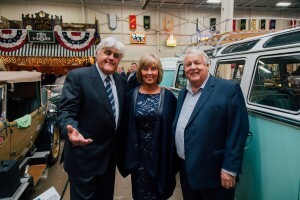 It all began with a gala with special guest Jay Leno who put on a fantastic show and was able to tour the museum with Mary and Ted Stahl. 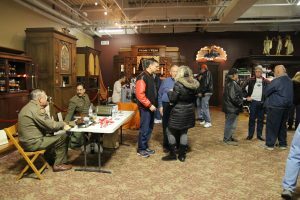 On Veterans Day, we held our 3rd Annual Open House where veterans, their families and all who support them, were invited to tour the museum, buy shirts, hats and dog tags to support our local heroes. 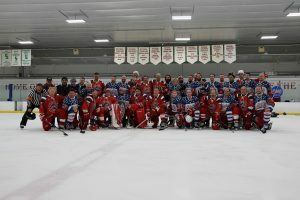 We capped off the trio of fundraisers with the Stahls’ hockey team vs. Detroit Red Wing Alumni in St. Clair Shores, Michigan. We are so honored to be able to host these gatherings for our veterans as a way of giving back to those who gave so much for our freedom. All funds raised will be donated to the Disabled American Veterans, Michigan region. Thank you to all who have served, are currently serving and their families! We will see you next year!